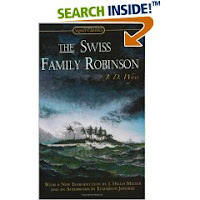 The Swiss Family Robinson, by Johann Wyss, et al, was not exactly your Disney Feature Film. Again, I read this book because I enjoyed the Disney film. I chose to read the book at this time because we were going on a vacation to the coast (last week) and I thought it would help out me in the mood for wind and waves! The book reads like a bedtime story that Wyss was telling to his sons way back when in the early 1800's. It's rather wild and random in nature. The introduction to the copy of the book that I have says, "Certainly The Swiss Family Robinson is one of the most beloved adventure discovery books of all time, but one should not be tempted to use it as a survivor manual, for disappointment would be sure to follow!" The family has truly amazing adventures, that is certain. Frequently they are quite unbelievable. On one island they were attacked by bears, caught and tamed ostriches, planted fruit trees (miraculously packed onboard the ship which they wrecked in), discovered sugar cane, beached whales, potato fields, rubber (from some place I can't remember!) and cotton fields. They had absolutely everything that they could possibly need and a father that knew how to do anything and everything to boot! Miraculous! This book definitely had the Disney Treatment and, in this case, I'd say its the better off for it. (The Malay Pirates for example were a nice touch.) This book would not survive were it written today. In fact, I would venture to say that if any Animal Rights activist got their hands on a copy of this book and actually spent the time and effort to read it, there would be a huge public outcry and banishment of the book. (The only reason I'm willing to announce this fact is because I already own my own copy and am in no danger of not being able to obtain one.) The descriptions of their hunting expeditions are a bit much. Esp. for a bedtime story! I did find it rather gruesome. The reason Johann Wyss orignally wrote (or told?) this story to his sons was to promote a spiritual outlook on life and to encourage them in manly persuits. I applaud that and if that's your game, you'll like this book. I think men are far too weak these days and need some manliness (and LIFE!) pumped back into them. (That's another argument for another post.) This book definitely goes the distance in promoting athletisim, weaponry, and encouraging one to provide for one's family while living peaceably. There is a heavy emphasis on moderation and self control so the only animals that they are "out for" are the ones that do the family some service. Many wild animals they kept and tamed for their personal purposes and to teach the sons a sense of responsibility and ownership. So the lessons of the book are good if you choose to view them in a positive light. All in all, this was an enjoyable, (and frequently hilarious). . . (and frequently eye rolling). . . (and frequently nauseating), good read. I'm very curious and eager to watch the Disney version again, which I do prefer in just about every particular. It's balanced and wholesome in a very fun and entertaining way. A much better bedtime story, if I do say so myself! I love your book reviews. You make me smile. I can just hear you talking when I read what you have typed. Smiles. You make me smile.